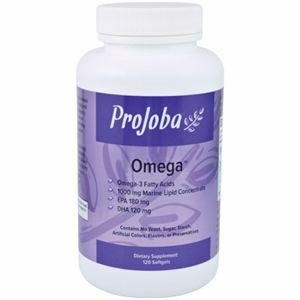 Projoba Omega is a natural marine lipid concentrate containing valuable Omega-3 fatty acids, EPA (eicosapentaenoic acid) and DHA (docosahexaenoic acid). Omega-3 fatty acids help support your heart and circulatory system, brain and central nervous system, vision, and healthy cholesterol levels. Projoba Omega contains all natural ingredients standardized for high constant power. Recommended Use: As a dietary supplement, adults take one to two capsules twice daily with meals or as directed by a health professional. Store in a cool, dry place away from direct light. CAUTION: Only for adults. Do not take this product if you are allergic to iodine, they are using blood thinners or anticipate surgery. Check with your doctor before using this product if you are pregnant or diabetic. Keep out of the reach of children. Store at room temperature away from heat EXCESS ABOVE 104 ° F (40 ° C). INGREDIENTS: fish oil, EPA, DHA, gelatin and glycerin, vitamin E, purified water.